Winter is a good time to be working on soil improvement, and you don't have to go out in cold weather to do it! Improve soil organic matter and soil fertility. Create a better seedbed for spring planting. The best winter cover crops differ from region to region, by growing zone and the crop's winter hardiness, but from a management perspective there are basically two types, winter-killed and winter-hardy, along with a third, blended type of the two. 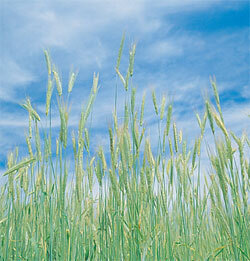 1 • Winter-killed cover crops: Killed by cold, but have sufficient biomass to protect the soil. Depending upon growing zone, the peas, clover, and ryegrass in the mix are winter-killed, while the rye and hairy vetch regrow in spring. Oats are an prime example of this first type. Sown in summer, they will put on a lot of growth, and often maintain active growth into early November, dying slowly after several hard frosts. The winter-killed mulch and root mass will hold the soil in place, however, until the following spring. Other crops that may be grown for winter-killed mulch include field pea, oilseed radish, and rapeseed. The caveat with this type of cover crop is that you have to clear the land and plant the cover crop early enough to get significant amounts of biomass to hold the soil over the winter. That could mean winter cover-cropping only on ground that grew spring vegetables, or it could require undersowing the cover crop in a summer crop such as corn. The big advantages of a winter-killed cover crop is that the mulch is easy to till under in spring, and the land can be planted right away. 2 • Winter-hardy cover crops: Survive through winter, resume growth in spring. Hardiest winter cover crop to stem wind & water erosion. Deep & extensive root structure prevents compaction, improves soil tilth. The second, winter-hardy type can either grow through winter or go dormant for a period when temperatures and/or daylight reach a certain threshold, then renew growth in late winter. They can usually be planted after the summer vegetable crops, and will grow through fall to establish root systems that protect the soil from the dynamic forces of wind and water over winter. Some examples of crops that will survive the winter — depending on winter temperature lows — include winter rye, winter wheat, hairy vetch, Austrian winter peas, and crimson clover. Winter rye and hairy vetch are recommended for the northern United States. In regions where these crops survive winter, they will grow vigorously in early spring. They will need to be mowed close to the ground, to stop growth, and then incorporated into the soil. Because decomposition of the cover crop debris will tie up nitrogen, it's a good idea to wait two or three weeks before planting. 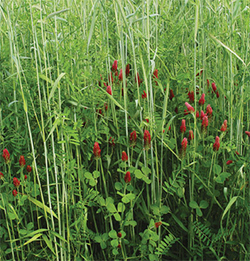 Many growers use a mixture of cover crops from the two categories. Johnny's Fall Green Manure Mix is a blend of winter rye, field peas, ryegrass, crimson clover, and hairy vetch. The peas, clover, and ryegrass are winter-killed. The rye and hairy vetch regrow in spring. Take note that if deer are numerous in your area, they tend to prefer winter rye over almost all other winter cover crops. You may want to consider sowing a mixture of medium red clover and oats, as the deer do not like oats as much. Another practice would be to sow forage turnip around the perimeter of the field to satisfy the deer's hunger. Sown by mid-August, turnips will generally grow slowly until temperatures fall below 20°F/-6.6°C. While turnip bulbs remain grazeable even after freezing, they do begin to deteriorate soon after a thaw.